Commerce Casino is simply the premier location to play popular table games in the Los Angeles area. On any given night, some of Hollywood’s elite stars can be found sitting at game table right beside regular players. Action is non-stop and the adrenaline starts pumping with one foot inside the elaborate front entrance. Play a hand or two at one of the numerous no-limit Texas hold ‘em tables. Take a stab at one of the casino’s famed world class tournaments that feature a million dollar prize on the line. The casino holds several daily tournaments for any skill level poker player that wishes to compete in the game. Match some of California’s best players in the California State Poker Championship event. Sit alongside the best of the best by winning a seat to play in the famed World Poker Tour final table in the LA Poker Classic. 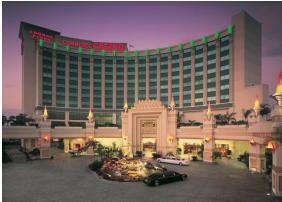 Commerce Casino enjoys a reputable status as the Poker Capital of the World. This dubious distinction comes from housing more poker gaming tables than any other casino or card room in the world. New players need not be intimidated by this status. The casino readily offers instructional courses on the game of poker. In addition, there are instructions available for all games on the playing floor. A player simply locates a Concierge to request this information. Above and beyond everything else, the featured game at the casino is Texas hold ‘em. There are more single table games of no-limit Texas hold ‘em in this casino than in any other casino on the globe. No Limit Hold ‘em games start with buy-ins at $40 and progress upward from there. Limit games can be found in the upstairs ballroom and the main floor. These are primarily lower limit games. The higher limit games are located in the hotel section of the casino. No-limit Texas Hold ‘em games are eligible for a daily promotional jackpot. Games featuring 1-2 and 2-4 $20 and $40 no-limit have a seed of $3,000. For these games the jackpot increases by $200 per day. At the present time the jackpot stands at $4,200. The super jackpot amount stands at $30,000. The $100, $200 and $400 no-limit games feature a $12,000 seed with a daily increase of $1,000. This jackpot currently stands at $19,000 with the super jackpot being $150,000 prize. Similar jackpot formats are available for 3-6, 4-8, 6-12, 8-16, 9-18, 15-30, 20-40, 30-60 and 40-80 games of limit Texas hold ‘em. Players holding the highest non-winning hand are awarded the Commerce Casino jackpot amounts. This is commonly known in the poker industry at the “bad beat”. When a player loses a hand and holds aces full of ten’s or better to a four-of-a-kind in Texas hold ‘em, that player receives 60% of the posted jackpot. The actual hand winner takes 20% and the remaining players split the last 20% of the jackpot. Bad beat jackpots at the casino have been known to reach the six figure mark. Daily double amount increases take place from 11 am to 12 pm; 7 am to 8 pm and 1 am to 3 am time intervals. Commerce Casino hosts daily no-limit Texas Hold ‘em tournaments for every skill level of poker player. Each tournament game fee includes the buy-in amount, entrance fee and small service fee charged by the casino. Action kicks off on Sunday afternoon at 1:00 pm with a $65 buy-in tournament game with one optional re-buy available. This exciting event continues Monday through Thursday at 6:00 pm. The prize pot of $7,000 is spread out across the five days of play each week. Going back to the days of the old west shoot-outs, there is a no-limit Texas Hold ‘em high noon showdown three days a week. This fast paced event takes place each Tuesday, Wednesday and Thursday afternoon at 12 pm sharp with a $50 buy-in fee and two optional re-buys. Action kicks into high gear with the arrival of the weekend. A high stakes game of no-limit Texas Hold ‘em plays out on Friday and Saturday afternoons starting at 1:00 pm. There is a $120 buy-in with only one re-buy option in play. After the dust settles and the gaming action comes to an end, one lucky player will walk away with a $10,000 guaranteed prize. Tournament action does not stop with the daily events held at the Texas Holdem Poker Room.Throughout the year the casino is host to several fast-paced, high action games that feature some of the best players in the state facing off against novice poker players. It is all a matter of how the cards play out once players are seated at the tournament gaming table. Things kick off with the LA Poker Classic Championship No-Limit Texas Hold ‘em Tournament held at the casino. This tournament stands out in the crowd as it is televised on the World Poker Tour stage via the Travel Channel. A national audience watches each February to see who will walk away with a piece of the $7 million dollar prize pie. This year’s winner Phil Ivey went home with a $2 million dollar bite in a tournament that started with over 400 players. Commerce Casino holds satellite tournaments throughout January and February to give players a chance to win a seat at this prestigious tournament event featuring a $10,000 buy-in amount. Next up in the tournament play is the California State Poker Championship. No-limit hold ‘em play gets underway each September with a $2,500 buy-in figure. Tournament play covers two days and averages approximately 90 players each year. One of the most notable players came to the table in September 2004. Hollywood star Ben Affleck made the transition from celebrity recreational player to poker pro when he took home the title and $356,400 prize at the tournament end that year. Affleck was also awarded a seat in the April World Poker Tour Championship the following year. Tournament play comes to an end with the Holiday Bonus Tournament held each November. Play covers 17 days and features buy-in amounts of $335 to $2590 range. During the course of tournament play, $15,000 is added to a single event when a player hold the highest point total for in-the-money finishes over the course of the tournament. Prize awards are guaranteed to be $200,000 for any event with an overall jackpot award of over $1 million dollars. Commerce Casino is home to what one can consider to be the world of poker’s super bowl event. This is none other than the famed world poker tour celebrity invitational. Each February some of the biggest named celebrities, sports players, poker players and a lucky few who earned a seat via a satellite tour sit down to face off in a high stakes game of No Limit Texas Hold ‘em. Some of the best laid poker hands in the game will be placed on the table before a nationally televised audience. At stake is a prize of $200,000 with celebrities playing for a $25,000 seat in the World Poker Tour Championship in April and $5,000 for a charity of their choice. Come early to secure a seat in the stadium viewing area for some of the best games of poker one can expect to see in a lifetime. For the first time ever, the winner of this World Poker Tour event was a female. Van Nguyen is no stranger to the game of poker. Her husband, Men Nguyen is a household name in the world of poker play. The female Nguyen beat out 444 of the best poker players in the planet to take home the winning jackpot. There is a unique promotion that continues to place Commerce Casino at the top of industry lists. It is now possible for poker enthusiasts to bring friends and family to the casino for personalized poker play. Feel like a celebrity with the “Bring Your Home Game to Commerce Casino” promotion. Participants receive the VIP treatment with a special poker game, a private dealer, pit boss, cards, playing chips and anything else a group can think of. When the hunger bug strikes, the private group can request table side service or ask for private reservations at any one of the four restaurants on site. Hotel rooms at the adjacent Crown Plaza Hotel are also available. Groups of ten or more are welcome to play for a private table jackpot of $100,000. As play begins, a plate of appetizers is brought to the table courtesy of the casino. At the end of the night, a group receives pictures of the night’s event on a downloaded disk to take home. The gaming environment at Commerce Casino is nothing short of luxury. The upscale establishment goes the extra mile to cater to a clientele of celebrities, sports stars, poker world leaders and everyday players looking for a great place to get a few games of cards out of the way. There are currently 243 gaming tables in the establishment with an additional 100 table expansion in the works. There is also a 200 room Crowne Plaza Hotel on site as well as other sources entertainment including a comedy club. This entire atmosphere contributes towards Commerce Casino providing players with a premier playing environment that is unbeatable in the poker playing industry. Unlike many establishments in Los Angeles, Commerce Casino values the privacy of its celebrity players whether these individuals are movie, music or poker industry icons. As such there is no public disclosure of the famous faces that grace its establishment each year. 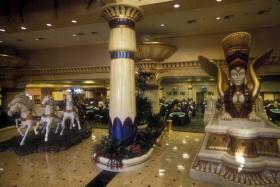 The casino does pay tribute to industry greats that helped make the game of poker a popular house hold name of today. This is done with what the casino refers to as the World Poker Tour Walk of Fame. Like the Hollywood Walk of Fame or Rock Walk of Fame, this prestigious walk of fame honors those individuals that made a significant contribution to the popularity of poker in America. Initial inductions into the World Poker Tour Walk of Fame were held in a star studded ceremony with celebrities and poker professionals in attendance. Inaugural members were Doyle “Texas Dolly” Brunson; Gus “The Great Dane” Hanson and James Garner. These three individuals are respected for what they bring to the game of poker. Commerce Casino is centrally located at just 23 miles from the Los Angeles International Airport and 16 miles from the Long Beach Airport. 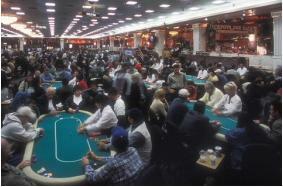 The gaming establishment has been the elite poker room to the stars since 1983. In that time, Commerce Casino has made a name for itself as being the utmost force in the poker playing gaming industry to be reckoned with. Many have attempted to duplicate the upscale features of this casino. Few have succeeded in reaching the levels of success as Commerce Casino. For this prestigious establishment in a class all its own, membership has its privileges. This entry was posted on Tuesday, June 10th, 2008 at 5:11 am	and is filed under commerce feature. You can follow any responses to this entry through the RSS 2.0 feed. You can leave a response, or trackback from your own site.